Cells are the basic building blocks of all living things. The human body is composed of trillions of cells. Every organ in our body is made up of particular types of cells which carry out specific functions. Throughout the brain and spinal cord we all have nerve cells called 'neurons', which transmit 'messages' (electrical and chemical signals). Surrounding our neurons are cells called glial cells. Glial cells support and protect the neurons, provide the neurons with oxygen and nutrients, and remove dead cells. Glial cells are much smaller than neurons and we have many more glial cells than neurons. 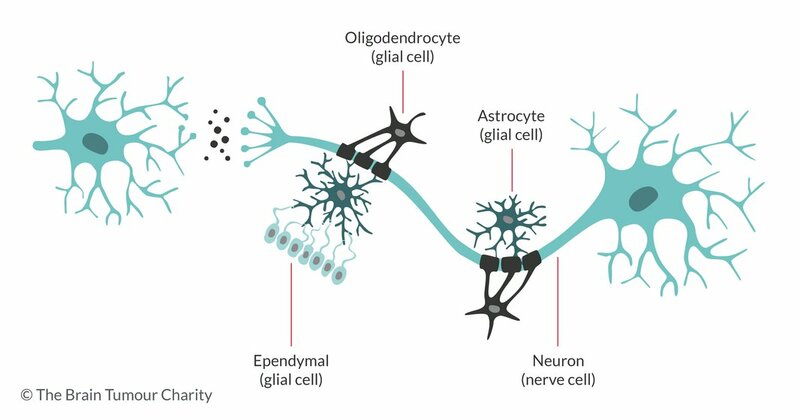 There are different types of glial cell, each of which plays a different role in supporting the neurons. The main types are astrocytes, oligodendrocytes and ependymal cells. Brain tumours can develop from any of these types of glial cells. Glioma is the collectivename for this group of tumours. Brain tumours that grow from ependymal cells are called ependymomas. 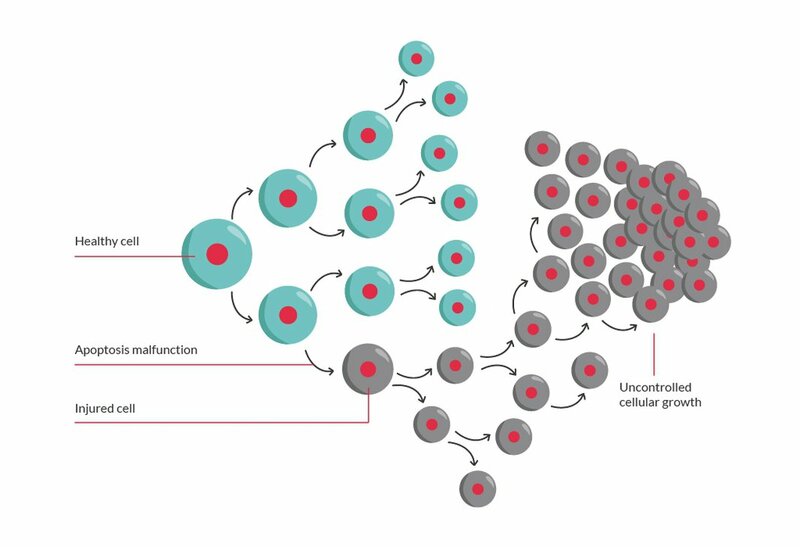 The images below show normal cell division and growth and what happens when there is abnormal cell division and growth, which can lead to the development of a tumour. Signals from your genes tell your cells when to grow and when to stop growing, when to divide and when to die. This means your cells normally grow in a controlled way. If these signals are not there, our bodies have further checkpoints to stop cells dividing in an uncontrolled way. When a cell divides, it has to copy its genes to put into the new cell. However, mistakes can sometimes be made when copying the genes. These mistakes are called mutations. This could be by either making the cell think it is receiving a growth signal even when it's not, or by shutting down the checkpoints that would normally stop the cell from dividing. As a result, the cell continues to divide. Each of the new cells formed will also have this change (mistake) in the gene and so will also keep dividing when it shouldn't. As a result, more and more cells keep dividing and develop into a tumour.